If you're scouting for a casual yet totally stylish getup, consider pairing a DKNY x cara delevingne cara x biker jacket with a black shift dress. Both pieces are totally comfy and will look fabulous together. Perk up your look with black leather over the knee boots. If you're all about relaxed dressing when it comes to your personal style, you'll love this chic pairing of a DKNY x cara delevingne cara x biker jacket and a red floral casual dress. Black leather chelsea boots are a savvy choice to complete the look. 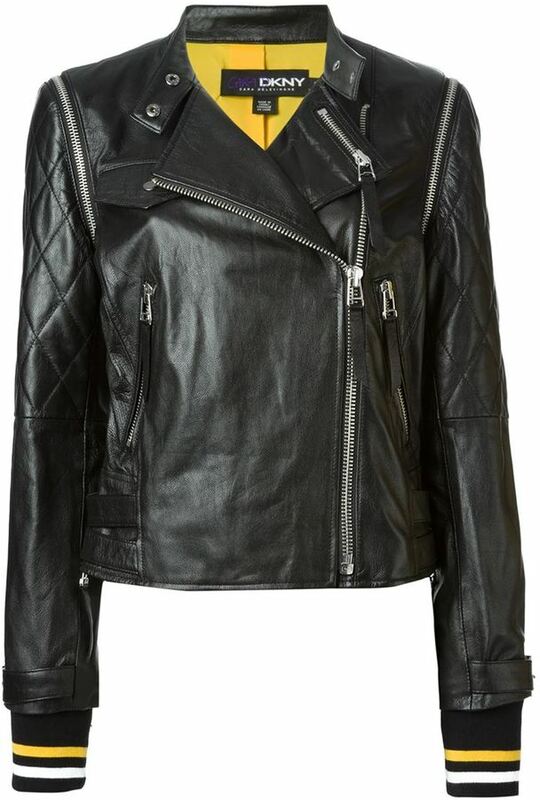 If you're after a casual yet stylish getup, rock a black quilted leather biker jacket with a black full skirt. Both pieces are totally comfy and will look fabulous together. Wearing a pair of black leather mid-calf boots is a simple way to add extra flair to your ensemble. If you're looking for a casual yet totally chic outfit, choose a DKNY x cara delevingne cara x biker jacket from farfetch.com and blue skinny jeans. Both garments are totally comfy and will look fabulous together. Up the cool of your ensemble by wearing red suede pumps. If you're all about functionality dressing when it comes to your personal style, you'll love this totally chic pairing of a black quilted leather biker jacket and a black slit maxi skirt. Up the cool of your ensemble by complementing it with black chunky leather ankle boots. If you're after a casual yet totally stylish look, consider teaming a DKNY x cara delevingne cara x biker jacket from farfetch.com with navy jeans. Both items are totally comfy and will look fabulous paired together. Finish off your getup with tan nubuck lace-up flat boots. If you enjoy a more relaxed approach to style, why not consider teaming a DKNY x cara delevingne cara x biker jacket from farfetch.com with navy skinny jeans? A pair of brown suede lace-up flat boots looks very appropriate here. If you use a more casual approach to dressing up, why not pair a DKNY x cara delevingne cara x biker jacket with black skinny jeans? When it comes to footwear, this getup is complemented nicely with blue low top sneakers. If you're scouting for a casual yet totally stylish getup, reach for a DKNY x cara delevingne cara x biker jacket and navy skinny jeans. Both garments are totally comfy and will look fabulous together. Take a classic approach with the footwear and go for a pair of tan leopard calf hair ankle boots.